That’s the attitude, isn’t it? People don’t think those who own Motorcycles, Snowmobiles, ATV’s, Canoes, Kayaks or Mopeds are rich. But mention the word “Airplane” and instantly, the assumption is—Michelle and I must have a mattress stuffed with dollar bills (soggy ones, in our case, as we cling stubbournly to our aging water bed). I’ve yet to see a single hand fly up. It’s a question that troubles me deeply. Because without “The next generation of pilots,” General Aviation is dead. Allow me to ask the same question to Why Fly Members who do not have their own airplane—especially if you don’t have a Pilot’s License yet. Are you planning on buying your own airplane soon? But that hasn’t stopped us from buying a string of aircraft over the decades. A lot of the time we were living well below the poverty line (one of the joys of working in “Show Biz”—especially in Canada). And we never paid more than $10K for any of our flying machines! And here’s the kicker: Most of them didn’t have their pilot’s license when they purchased! If you have a Pilot’s License, how much of your hard-earned money did you give to Flying Schools in exchange for a piece of paper that becomes worthless the first time you “cough the wrong way” during a Medical? If you don’t have a license yet, suppose—instead of renting aircraft—you put that same money into your own airplane? Yes, there are costs involved, but we can show you how to keep those to a minimum. Yes, you still need to pay a Flying Instructor—for Dual time—but a lot of Flight Schools will let you learn on your own airplane. If they won’t … there are a lot of terrific Freelance Instructors out there. And when you fly solo, all you pay is gas and oil. The money you would have given to the school went into your airplane instead. By the time you’re licensed, you’ll have significant equity in—or may outright own—your airplane. Because you can go flying whenever you want, you’ll fly more, And you’ll become a better pilot. And you’ll still have a—basically—“free” Pilot’s License. This isn’t some “Ageing Hippie Theory.” Michelle & I have watched it happen time and time again. I’ve lost track of the number of people we know who got licensed on their own airplane. And the vast majority of them are still flying. How will I know the airplane is any good? You won’t. You’ll need help. Fortunately there are a lot of great organizations—like AOPA, EAA, & AAA in the States—COPA, the RAA & UPAC in Canada—whose members will be only too happy to help you find a good airplane. And you would NEVER buy an airplane without a pre-purchase inspection from an Aircraft Engineer with impeccable credentials. It may cost you a few hundred dollars, but you’ll save thousands. And once the Engineer’s report is in (they always find something), the asking price will—inevitably—go down. Insurance? 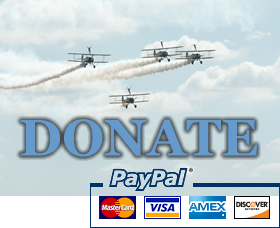 Join an organization such as AOPA in the States, or COPA in Canada, and take advantage of their special group rates. (As COPA members who live together, Michelle & I are both covered by one low payment!) Regardless, you’ll pay less than for a 2nd car. Hangar fees? Don’t keep your plane at the nearby International Airport. Accept a slightly longer drive to a smaller airport outside of town. If you buy a taildragger, rent land from a farmer and get your own hayfield runway! (We’ve been doing that, in one form or another, for more than 35 years! Most of our friends keep their planes at their own airstrips). Right about now, the Flying School Operators are getting pretty upset with me, but they really don’t have to worry. Because the reality is—most folks will still get their license in the same old way. Within one year of getting their Pilot’s License, “the drop-out rate” with new pilots is 90%! Because it’s one thing to rationalize spending $150.00 an hour to rent a Cessna/Piper/Diamond/ Airplane-Brand-of-Your-Choice while you’re getting your license (plus Instructor’s fees), or taking friends & family flying once you’re legal. But after a year of aviating over that same hundred square miles you’ve grown used to (when a rental plane is available … if the winds are low enough … and the school decides you’re “sufficiently current” to fly on your own), you start thinking about a lot of other things you could be doing with that $150.00. Can’t blame folks. That’s just human nature. With the exception of the obvious restricted areas, you fly where you want, when you want … anywhere your airplane will take you. … all over the North-East and Mid-West. … coast-to-coast across North America. We’ve seen this magnificent continent in a way few will ever experience—from a few hundred to a few thousand feet up. Not only that, but everywhere we touched down, we made new friends—folks who still keep in touch. Some, more than four decades later! Your own airplane is the ultimate freedom machine. Nothing else comes close to it. If you want to know what it truly means to be free … why are you sitting there? It’s time to go and find your airplane. I guarantee, it’s sitting quietly … at a small, rural airport … in a T-hangar … at a tie-down … in a barn … or in some farmer’s field… patiently waiting … for you. All you have to do is go and get it. In the months to come, we’ll tell you more about finding, maintaining, and flying your own airplane (from our unique, Why Fly, point of view). Glenn Norman is a Co-Founder and the Editor of Why Fly. Learn more. I have actually started looking for “a bargain”. (In no rush) I think that perhaps I have been on the ground long enough. We’ve got a great airport up here …. seems a shame not to use it. The prices are certainly much higher than the last time I looked however! So far I have paid .. L-16 -$7.5k, C-170- $9.5k, Arrow-$38K, Archer $28K, Comanche-$35k. Somehow methinks I will never see those prices again!